By James Q. Wilson, John J. DiIulio, Jr.
Are you sure you want to remove American Government from your list? 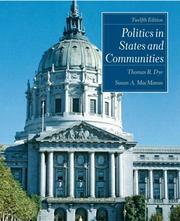 This classic text, known for its authoritative scholarship, clarity, and comprehensive coverage, explores the foundations of our national political system and shows how the fundamental features of our government influence the lives of all Americans. 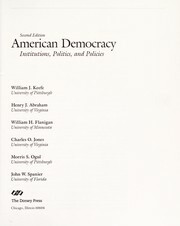 American Government, Ninth Edition, focuses on three fundamental topics: the institutions of American government; the historical development of governmental procedures, actors, and policies; and who governs in America and to what ends. American Government's treatment of public policy continues to set the standard in the field. - Back cover. in English - Brief version, 9th ed. in English - Brief version, 8th ed. in English - 10th ed., Advanced Placement ed. in English - Brief version, 7th ed. in English - Brief version, 6th ed. in English - 5th ed., brief version. 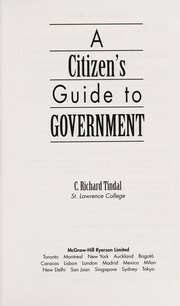 in English - 2nd ed., brief version. in English - Brief ed. 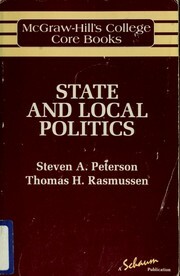 American government: institutions and policies. 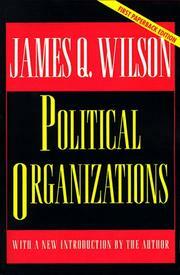 More by James Q. Wilson, John J. DiIulio, Jr.
July 9, 2014 Edited by Bryan Tyson Edited without comment.